A note came up on Facebook today reminding me that it was one year ago today when we purchased out tickets for CMA Fest 2016. And now it’s nearly here. Just 10 days to go to the start of the festival action on the main stage. Of course there’s action before than. On the Monday CMA World Global gives the Festival a truly international feel, with acts from around the world playing. To help fans plan how they will navigate the whole event, with all the acts and stages CMA created an app which is really well designed. They have avoided overloading it with to much material and stuck to the info fans really want. This include a ‘my schedule’ which helps you pick out the acts you want to see, what time they are appearing and which stage they are on. So who is on my list? Well, we will in the stadium for the ‘main event’ but alongside of that I have Jersey songstress Frankie Davies pencilled in for Monday evening; Jake Owen starts our four day festival viewing at 10am (I don’t think I’ve ever been to a concert at 10am!) at the Chevrolet Riverfront stage. I’ve also got Kristian Bush, Maddie & Tae and Margo Price on the schedule. Any suggestions of other acts who are ‘must sees’ gratefully received. Author tonyhendo57Posted on May 29, 2016 Categories CMA Fest, concerts and tours, country music, NashvilleTags CMA Fest, country music, nashvilleLeave a comment on One year ago today…. Another announcement about CMA Fest as the event gets closer with the announcement that Chris Young will kick-off this year’s festival at the event’s official opening ceremony at Nashville’s Ascend Amphitheater on June 8 at 11am. The opening ceremonies are free and open to the public. The stage is located at the foot of Korean Veterans Boulevard and First Avenue (south of Riverfront Park), and gates will open at 10AM for the event. Two new entries in this week’s UK country chart. Major US star Blake Shelton’s new album If i’m Honest, debuts at number 2, while Irish country singer Mary Duff’s latest offering, Changing Lanes appears at number 10. 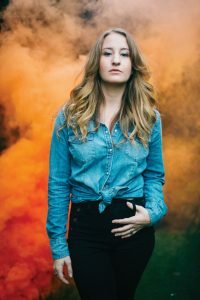 Moving to the top of the chart is another debut album, Midwest Farmer’s Daughter by Margo Price. The album has received rave reviews and Price has recently been playing a number of gigs in the UK and appeared on BBC2’s Later with Jools Holland. Next month she is back in the US and will be playing a number of dates during CMAFest2016 including the Park Stage on June 12 and two dates at 3rd & Lindsley on the 14 and 15. So hopefully I will manage to see her then. Just 16 days to go to the kick-off of CMA Fest 2016 and the line-up of artists on the main stage and the various others around the festival have been announced (Unless the organisers have some last minute surprises up the sleeve of their rhinestone shirt?). Of course the focus will be on the big name acts but I’m really looking forward to seeing some of the performers at the other venues, particularly those I haven’t come across before? Among those I’ve spotted on the list are two UK acts, though there may be more. Singer songwriter Frankie Davies is from Jersey and played C2C this year. At CMA Fest she will be part of CMA World Global Live. Also playing the Global Live session are York’s Pauper Kings, a country rock band. Hope to catch both acts and if anyone knows of other UK artists playing let me know. 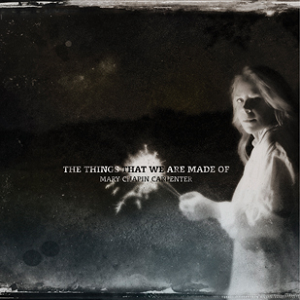 Mary Chapin Carpenter’s latest offering is the UK’s best selling country album this week after just two weeks on the chart. Last week’s number one, Cyndi Lauper’s Detour meanwhile has slipped to five while Jennifer Nettles new offering, Playing with fire debuts at number four. In the Billboard chart in the US the number one is Ripcord, by Keith Urban, number two here, while Mary Chapin Carpenter debuts at number eight. I’m so out-of-date that when I recently heard a reference to the UK charts coming out on a Friday I was mildly surprised. I still imagine that charts come out on a Tuesday lunchtime on Radio 1. Now of course the BBC pop charts are not the only ones. Like the US we now have a number of charts for different genres and niche markets, including country. It’s interesting to note the difference between two charts. The Official Country chart which is album based currently shows Detour by Cyndi Lauper at number 1; The things that we are made of, Mary Chapin Carpenter at 2 and Stayin’ up all night by Nathan Carter at 3. The album which has been on the charts for the longest time is the Shires debut with 52 weeks. Over at iTunes UK country chart, which is single track downloads, the picture is different number 1 is Keith Urban’s The fighter, number 2 Brad Paisley, without a fight and at 3 Thomas Rhett, die a happy man. But it’s when you look at paces 4,6 and 8 that you notice the difference. All three slots are held by Dolly Parton, Jolene, islands in the stream and 9 to 5. I’m not sure how many downloads it takes to chart but clearly the idea that the internet creates a long-tail of products is quite right. It will be interesting to see how long Dolly stays on the iTune list and if other older tracks make an appearance. American TV networks can be brutal. Programmes which seem to be popular or growing in popularity suddenly disappear, sometimes in mid-season. Now the same fate has befallen Nashville, the country music TV drama. The programme was well received in the US when it first aired and I think one of it’s great strengths was that the cast included real musicians and the songs where written by real songwriters. The fact that T Bone Burnett, artist, songwriter, producer, oversaw the music in the first series set the tone (though he later left the show). The programme resulted in a number of albums and it has to be said that these would stand on their own quality, and not just because they came out of a hit TV programme. So why has the programme been axed? Produced in the US by ABC in the UK it aired on More4. The debut episode attracted around 0.8m, by the season end this had dropped to about 0.6m and the second series opener attracted 0.5m. So not a huge ratings winner when compared to dramas on the mainstream channels this is quite low, but for a channel like More4 it was a decent performance. The show had also suffered a slide in viewing figures in the US, particularly among the key 18-49 demographic; this is the audience which networks believe they need to attract to win the big advertisers. 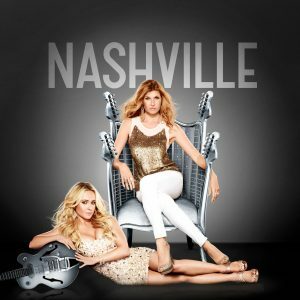 I think Nashville has been the best programme based on the music industry, certainly better than Vinyl, though there hasn’t been that much competition. So the guitars are being packed away and the amps switched off for the last time, just as some of the cast are set to tour the UK. I suspect the main spin off from this show may be a genuine music career for some of the performers. Before we get the music a quick review of the venue. 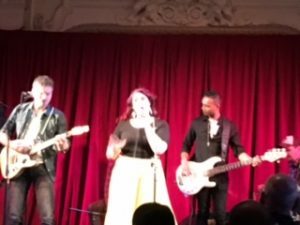 Bush Hall is in Shepherds Bush area of London and a great place to see bands. It’s a small, intimate if you are doing PR for the place, venue. A bit like watching a band in your front room, providing your front room has a small stage at the front and chandeliers. If it does you probably live in Downton Abbey or just down the road from Bush Hall in Buck Palace. Concerts are always good value. And so the gig. Jess, of Jess & the Bandits, is from Texas but her bandits are all from the UK. which perhaps reflects the growing interest in country music in the UK, influenced by a new wave of US artists. 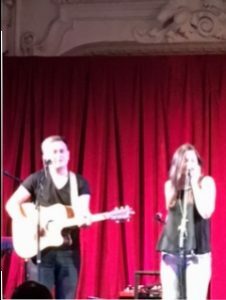 I first came across J&tB when they played on the late Sir Terry Wogan’s Sunday morning show, a performance she mentioned at the concert before playing their excellent cover version of the Jimmy Webb classic Wichita Lineman. Although the band has only one album behind, Here we go Again, them the mix of songs means that they can up the tempo and slow it down without losing the audience because of the quality of the material. Ready Set is a great romp of a track and Nitty Gritty deserves to be an anthem for equality. As well as the cover of Wichita Lineman the band also do a neat cover of Mamma Told me not to Come and you felt that you were with them at the slightly dodgy party described in the song. Because Bush Hall is so small it could be difficult to get the sound mix right for a five piece band but they do a good job and you get the feeling that these guys could make you feel up-close and personal in even the biggest venue. I did feel sorry for the drummer, who didn’t have a full set of drums but sat on and played what appeared to be a tea-chest, but was, I guess, a bit more hi-tech. Before we close, a quick mention for Luke and Mel who supported J&tB. Like the headliners they have played Country 2 Country and have a number of British Country Music Awards to their name. Good performers, good songwriters and well worth checking out. So the starting point for this blog was our trip to Nashville for CMA Fest and we are now just 36 days to the first act hitting the stage. That act will be Jake Owen on Thursday, June 9 on the River Front stage at 10am! Yes, 10am. Now that sounds like an early start for fans, but boy, it sounds a really early start for the performers. But that really sets the tone for the whole event. There are four stages which are back-to-back with acts and the challenge looks like trying to get to see all of the acts you want to catch. Even on the first day we’ve got Kristian Bush overlapping by five minutes with Maddie and Tae on different stages (First world problems, I know!) I’ve been a big fan of Kristian since I saw him at the first C2C festival in London. A great song writer and performer. I guess more seasoned CMA Fest goers will have their game plan sorted but we are need to do our research, how far apart are the stages and can we dash between them?